We have been thrilled to watch our Pinny (so much easier than saying young northern pintail drake each time) transition from his "baby feathers" to his adult magnificence. He is a duck with a lot of personality. My Pinny Grows Up video is the result of three months of filming, and shows Pinny from Nov. 24, 2016, through March 17, 2017. It is set to music by Beethoven, the Trio in E Flat Major, Op. 38, performed by Paul Pitman and obtained from MusOpen.org, a royalty-free music source. This group of photos shows the transition from youngster to adult with adult feathers. The pintail appeared in February, and is very visible in the fourth photo. The following photos follow Pinny from Dec. 21, 2016, through March 17, 2017. On Sept. 21, a female northern pintail duck visited Turtle Pond. I have rarely seen pintails. In fact, the only other times I've seen pintails in Central Park were Nov. 20 and Nov. 30, 2013, when male pintails (I think two, though both sightings may have been of the same male) visited the Pool at 103rd Street and the north end of the Reservoir. 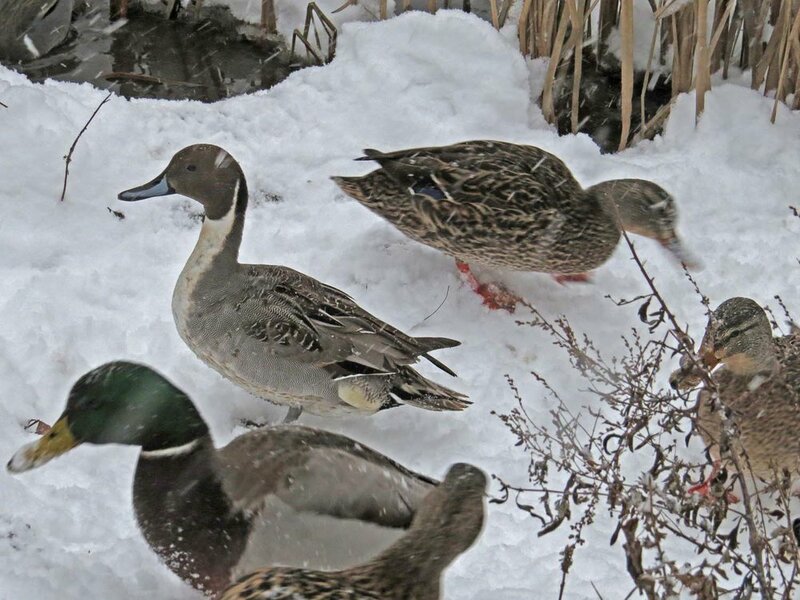 I included the male pintails I saw in 2013 in my Reservoir Ducks II video. I am now including that footage, plus video I took on Sept. 21, in a new Filming the Feathers video. The music is the third movement of a Beethoven wind octet, performed by Soni Ventorum Wind Quintet. The Audubon Web site has a gorgeous pintail photo, and a lot of good info on these handsome birds. The first five photos in the following gallery are of the male pintail duck taken in November 2013. The other photos are of our female visitor on Sept. 21.